Is this Britain at its best? 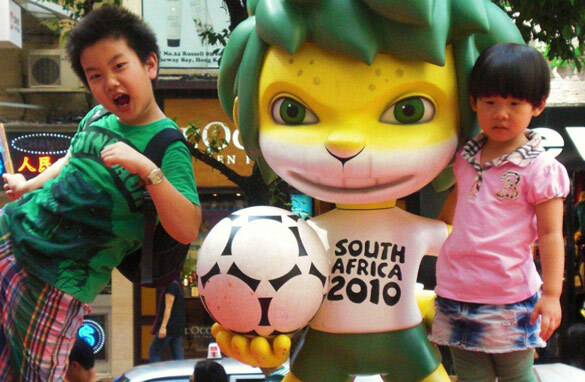 Children in Hong Kong pose with Zakumi, the 2010 World Cup mascot, before Sunday's final. Editor’s note: CNN's Hong Kong Operations Supervisor Matthew Booth watched every match of the World Cup on television in the wee small hours of the night from a cruel South-East Asian time zone. At the time of writing he is still married, still employed and not noticeably crazier than he was at the beginning. Hong Kong (CNN) - It’s finally over. The Spaniards have paraded their new shiny trophy around the stadium. Across the globe, people have jumped into canals and fountains, weeping men are already regretting reckless tattoos, gushing women are naming their new babies Iniesta, and children are dreaming of the day when they might lift the famous old trophy themselves. Millions of inches of copy are rampaging across printing machines for thousands of publications worldwide, and I am at the end of my road. As I finally turned off my wheezing television at 5:20 a.m. after watching ALL 64 games and 5,880 minutes of the world’s best football, I inevitably began to think back on the incredible times of the last month. There have been some unforgettable TV moments on the way to the final, and what better place to reflect on them than my final diary entry from the couch? Most thankless job: I’d have to salute the fearless steadi-cam operator at pitch-side for this one. These poor individuals traipse up and down tirelessly wearing a massive rig that makes them look like they’re running for the bus with heavy shopping, and what thanks do they get for their wobble-free throw-in shots? They get spat at by Ronaldo, clobbered by Gabriel Heinze and clattered by slide-tackling defenders. So Steadi-Cam Operators of the 2010 World Cup, I salute you. Throw-ins have never looked so good. Most revealing camera shot: A good contender for this one was the shot of the referee and linesman realizing they had got it horribly wrong on the sideline after the entire stadium had just seen a replay showing that Carlos Tevez’s goal against Mexico was good enough to be used in a FIFA instructional video titled "The offside rule at its most obvious." But even more revealing than that was the agony-to-ecstasy of Luis Suarez on his way down the tunnel after being sent off when he realizes that his blatant handball, and an unfortunate penalty=taking decision by Asamoah Gyan, had robbed Africa of a place in the semifinals. It was the celebration of a pick pocket who had been let out of jail on a technicality, and whether you agree with his actions or not, the shot of his celebrations have been burnt into the collective memory of this World Cup. Best fans on TV: Very few fans could be heard above the din of the vuvuzelas, but visually there was a great deal to like. The Ghanaian fans with the painted clay pots on their heads, the Japanese dressed as skittles, the English Knights of St. George and the massive sea of orange that accompanied Holland on their march to the final all contributed to an extremely colorful World Cup. If only the North Koreans had all worn Kim Jong Il jumpsuits. But the most surprising, and therefore fan champions, would have to be the Americans. The Captain America muscle suits and Abraham Lincoln outfits were almost a required dress code to join "Sam’s Army." Well done to the American traveling band, now you just need to come up with a better chant than "Yoo Ess Eh! Yoo Ess Eh! Yoo Ess Eh!" Best TV stadium: The magnificent and inspiring Soccer City in Johnannesburg would have won this hands down if it weren’t for the awful state of the pitch. Sandy patches in the penalty box and corner flags are not okay for a World Cup final. Rustenberg had the best pitch by a long way - you could have played snooker on it - but the most awe-inspiring stadium had to be Green Point in Cape Town. The perfectly-framed view of Table Mountain from certain camera shots inside the upper tiers would be hard to better anywhere in the world. Quite breathtaking. Best show of emotion: Diego Maradona jumping into the arms of his coaching staff after the victory against Mexico, England coach Fabio Capello looking distinctly unhinged against Slovenia, and Dunga trying to rip the dugout to bits with his bare hands during the Brazil-Holland game were all worthy of YouTube. My favorite, though, was North Korea's Jong Tae-Se weeping like an onion farmer during his team's national anthem. The way he kept trying to sing but couldn’t get the words out through the blubbing was a nice change from the dignified tear or the stoic lip quiver that is customary on those occasions. Perhaps he was just terrified of Brazil. Best slow-motion replay: The most amusing was certainly England defender John Terry launching himself sideways, six inches off the ground, trying to get his face in front of a Slovenian shot. For all the negative press he’s been getting for his rather sad dressing-room revolt, this replay showed all his guts, dedication and determination to lay it all down for the cause. But the best replay had to be Giovanni Van Bronckhorst’s goal for the Netherlands against Uruguay in the semifinal. There was only a ball-shaped gap between the Uruguay goalkeeper's outstretched hands and the post, and that’s exactly where he squeezed the Jabulani. In super slow-mo, it was beautiful enough to make your eyes well up. So that’s a small and by no means comprehensive selection of my favorite bits of this World Cup. No doubt you have different moments which stood out for you. I’d love to hear about them, so feel free to write some down in the comments section for everyone to enjoy. Now life will return to normal. I walked around Hong Kong before the final, and the giant football-related displays were already being removed and replaced by Toy Story 3 propaganda. It was heartening to see there were still plenty of kids who preferred having their picture taken next to Zakumi than Buzz Lightyear. When we get to the next World Cup in Brazil four years from now, maybe these kids will be old enough to stay up and watch. It seems a long time to wait. Long enough to get off the couch and start saving for a flight to Rio. As life returns...the sporting dust will settle...not only on the worthy winners of the tournament Spain, who demonstrated what a nation moving as one, acting as one, in harmony and being one in heart, mind, song and voice can do. Unity can bring success of an unparalleled proportion. This is where we must congratulate South Africa. No one really considered that these games would be organized so efficiently...even fan behavior warrants a mention. Well done a tremendous effort for a people with very little recent experience of hosting international events. A superb team performance. England take note! 3. Donovan's goal against Algeria, taking the USA from going home to going on. 2. Ghana's cross bar PK, heading them in the opposite direction: going on to going home. 1. Iniesta's last minute goal, ensuring Spain's win and FIRST title came in the actual run of play. Well done (well, except for #2)! Life without the world cup...is very drab indeed. Well done Matthew Booth on surviving through all 64 games! It is quite an acievemnt considering some of the bores we had to sit through! I must say I'll be missing your updates the most, as they made hilarious reading. How about the 7-0 defeat by Portugal over Korea. That was quite a freak score! Brilliant article, Matt. well done for watching all the 64 matches. North Korea's emotion may have been from the realization that, now that they've seen the outside world and know that Kim Jong Il's fantasy-land is nothing but lies, they'll be put in the gulag when they return home. Steep price to pay for playing soccer on the world stage. To me the most well behaved and disciplined were the asian teams. well done matthew! well done spain! i've also diligently (well almost, anyway) followed WC 2010, watching the matches in the same timezone as yours. now that it's over, i'm wondering what life was before the games started. thanks South Africa for a very exciting and unique world cup! I'd add the moment, just a moment, where it looked like South Africa might actually beat France 4-0 to reach the second round. V good series. We want more of your blogs on any topic. well i think this world cup was a great seriz of shocks... such as Italy and France who were top 1, 2 at the last w.c in 2006..... 3 cheers for Spain!!!!!!!! [yawn] who won? leno !? no way ! WHAT ABOUT THE CENTRAL AMERICAN AND CARIBBEAN GAMES TAKING PLACE IN PUERTO RICO- MAYAGUEZ 2010? My memories:  Chile's first half exploits till they hit Brazil, no one played with the resolve as they did for at least half a game. Gyan's cheap elbow shot which turned us off on his field exploits. Bayern Munchin's players total goal scoring – everyone is a striker on that team. The fans wherever they were from made the cup a great success to watch  Vuvuluzas – bring em back – loved them  The woeful umpiring and the sympathy for those who endured some really gross calls. The color and noise and fan deliverance in custom and fevor. Could easily have lived without Dunga and his childish display of emotions. He actually spoiled the games for me. As you note there are more but these will live forever in my mind – well maybe for a bit of more time. I liked the fair-play and honesty of the North Korean team; it was so refreshing, and it was great to see them always try so hard as a team. They were clobbered eventually of course but they also put in some very fine football and can all be proud. The team from the hardest place and in the hardest group. Well done North Korea. It's never easy, but you shined proud and fair. Have you observed these new hybrid utility cubs? They're displaying up all over the location, rescuing golfers from all sorts of circumstances. The reason for this really is uncomplicated; they open up up opportunities for a variety of excellent new pictures.